‘Winterfell’ was an episode built on parallels and call backs, mostly related to season 1 episode 1, ‘Winter Is Coming.’ Despite this, I thoroughly enjoyed it and watched it twice back to back. 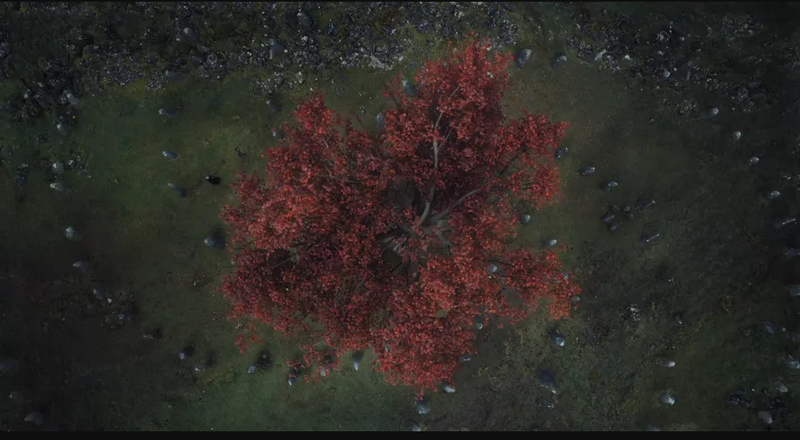 Before we get to anything actually involving ‘Winterfell,’ can we take a moment to talk about the new intro? This is the first major change the Game of Thrones intro has had in the show’s entire run. There have always been small changes, of course. The episode shows different areas on the map depending on where the characters shown in the episode are located. Now we’ve switched perspectives entirely. We come from north of the Wall and follow the path of the Army of the Dead. And, sadly, that path mows over Last Hearth first. We see from the way the tiles flip that they are already there and I do wonder if that will be the aspect of the sequence that changes each week going forward. 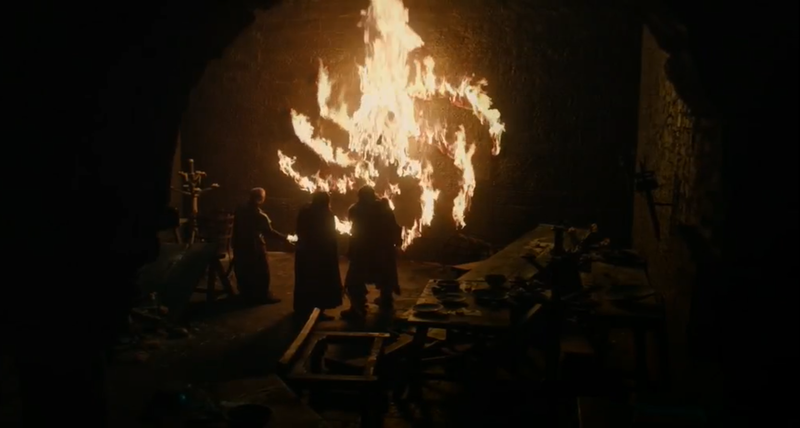 The destruction of Last Hearth that was hinted at in the title sequence brings me to the first parallel with ‘Winter Is Coming.’ This particular parallel is also seen several times through several other episodes throughout the course of the show. 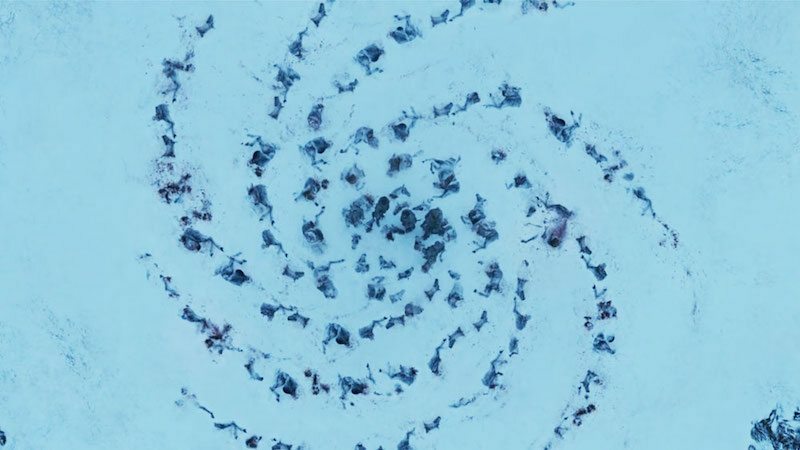 The very first time we see the White Walkers using the bodies of the dead to create a pattern of some kind is in the very first sequence of the very first episode of the entire show. The specific spiral pattern that poor little Lord Umber is impaled in the middle of doesn’t emerge until season three, however. So what the heck does it mean? ‘Winterfell’ doesn’t bring us any solid answers, but we can speculate. 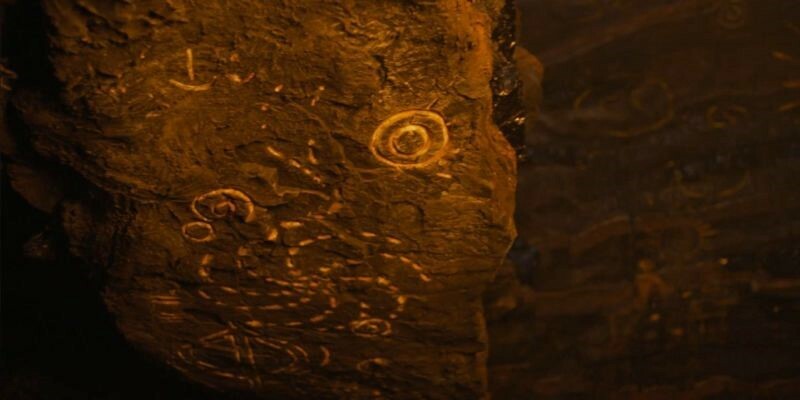 Based on interviews, we know the origin is the Children of the Forest themselves. Based on show content we can deduce that it’s somehow involved in the creation of the Night King, and he’s been using it every since then for some reason. But why stick poor little Baby Lord Umber in the middle of it? We just don’t know. We may not ever know. There are too many loose threads for this to be wrapped up in five more episodes, but we’ll see if this ends up being one that’s explained or just left open ended. I’m so sorry, Baby Umber. I cursed you. You didn’t just get mowed down by the Army of the Dead, but mutilated and turned into a Wight. I’m so sorry. It was a pretty amazing sequence, though. It seems like the audience is split on whether they saw Lord Umber’s eyes opening blue behind Tormund or not. I noticed it and started screaming to myself that stuff was about to go down, but for others that piercing shriek was the first sign that something was going horribly wrong. This Reddit reaction just about sums it up. This sequence was also amazing because of Tormund’s “I’ve always had blue eyes” line. Honestly, Tormund is one of the highlights of the show for me. 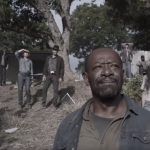 I know lots of characters are about to die, but can we keep him around please? His dialogue is some of the funniest on the show. Humor is difficult when you have a show as dark as this, but somehow Tormund’s lines are just as believable for his character as they are hilarious. Please, show runners, let this man make it to the end. While this was certainly the biggest and most meaningful parallel, it certainly wasn’t the only one. Early on in the episode we get a shot of a kid in Winter Town climbing up high to get a view of the royal caravan coming into town. This calls back to both Bran and Arya doing the same when King Robert Baratheon came to Winterfell. We even have the kid brushing past Arya as he rushes to find a high vantage point as if to draw particular attention to this parallel. Jon and Arya’s hug was also a call back. The last time they saw each other they were discussing Needle and then embracing each other in a very similar way. They’ve both come so far and evolved since then, but their love for each other is still incredibly strong. This was one of the reunions I was looking forward to the most. And finally the episode ends with an encounter between Bran and Jaime. Like Arya and Jon, both of these characters have changed dramatically since season one. 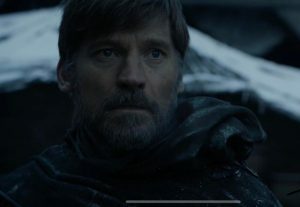 Jaime is no longer a man who would push a child out a window and Bran, well, he’s just a weird not human thing (Three Eyed Raven, whatever that means, because nobody on the show seems to know either). But the tension was palpable in the air. It was so tense, in fact, that they chose to cut to the credits as realization starts to wash over Jaime’s face. Most importantly, it very much felt like this was the last time our characters would be happy for a very long time. Sure, there were sad and tragic moments, but we also saw the Starks happier than we’ve seen them since the pilot episode. Jon and Arya’s reunion was particularly joyous, which makes me think one of them (likely Arya) will be dying quite soon. This happiness can’t last long. This is Game of Thrones. Happiness just isn’t a thing here. It’ll get taken from us soon enough. While I generally enjoyed the parallels and character moments, there were parts that bothered me. 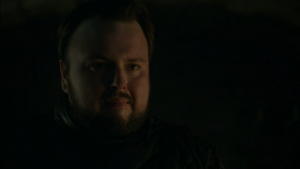 Firstly, while John Bradley absolutely killed it in regards to conveying Samwell’s emotions upon learning that both his father and brother had been killed, I’m not entirely sure I like what came next. It felt like he was only telling Jon about his parentage to create a wedge between him and Daenerys. This is an understandable emotional reaction for many people, but for some reason it doesn’t mesh with the Samwell I’ve grown to know over the past seven seasons. Samwell never came off as someone who’d seek vengeance in such a way. Though I suppose it could be less vengeance and more fear that if Daenerys takes the throne, she’ll continue to be brutal. He said as much, but it still felt like an act of vengeance and that just doesn’t jive with my Samwell Tarly. Meanwhile, I guess stuff is still happening in King’s Landing. Stuff I don’t care much about. I mean I guess it’s important. But I definitely sped through the Cersei/Euron scenes on my second watch. The only positive thing Euron brought to this episode was Yara so that she could escape and continue being badass between now and the finale. Outside of that, I don’t much care for any of that mess. And then we have the dragon sequence. In general it was good. 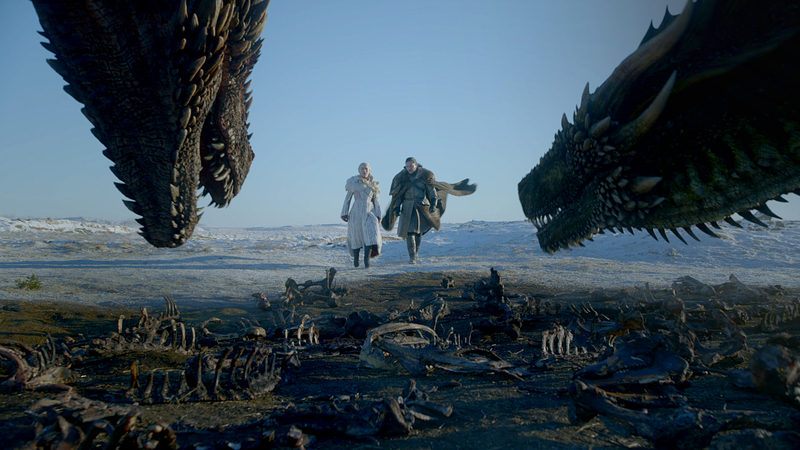 It was beautiful seeing the dragons flying through the white landscapes of the north and it was initially funny when they wouldn’t stop staring at them kissing. But as much as these two things are great on their own, it didn’t exactly flow with the episode. 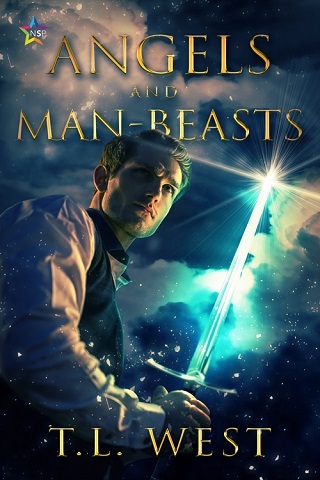 Like season 7, it felt rushed as the plot raced to get him on a dragon and in the air. And the humor, unlike Tormund’s brand of comedy, felt just a bit off and a tad too cringe. The elements just didn’t mesh well together, though individually I can appreciate them for what they are trying to do. Overall the episode wasn’t perfect, but it was still extremely satisfying. As I stuffed my face with Game of Thrones Oreos and immersed myself in the episode, I felt like the 595 days we waited was worth it. And honestly, that’s the most important thing. I can nit pick the details and disagree with character’s reactions to things all I want, but it was worth the wait and that’s all I can ask for. The spiral resembles the Targaryen sigil and the Night King rides a dragon so like hmmm. 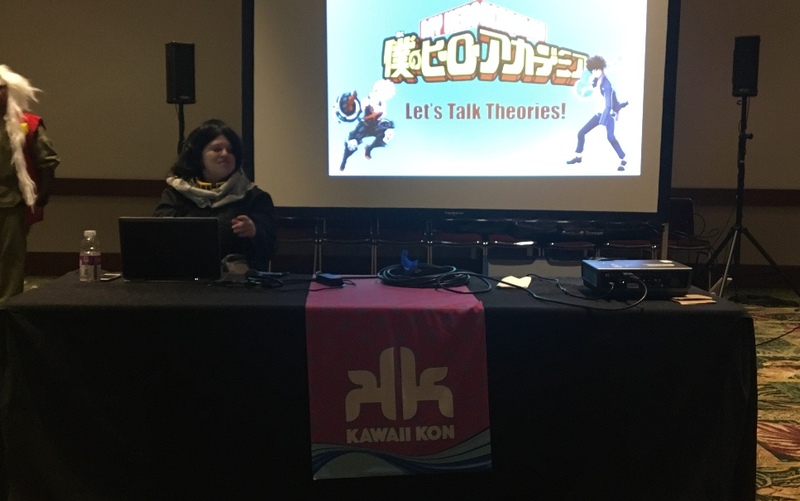 TIME FOR CRACK THEORIES. Also, I am hoping we’re going to touch on why Sam reacted the way he did next episode, when it’s Jaime in front of Daenerys. Because the Tarlys were her prisoners… and she burned them alive to make others fear her and fall in line. Which when you look at what made Jaime the “Kingslayer” is gonna end up being significant I hope next ep. I hope so. I mean, it’s not extremely out there for the average person to do what Samwell did but… he is not an average person.